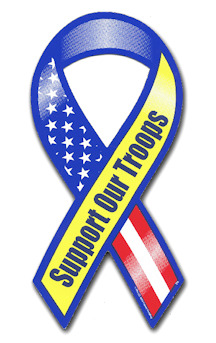 This compact 2" x 4" Support Our Troops Ribbon Magnet fits just about anywhere. The red, white, blue, and yellow ribbon magnet is manufactured and printed in the United States of America. We print on premium quality, super-thick (.030) magnetic material with top quality, UV protected inks. Be sure to remove, clean and reposition your magnet weekly. Beautiful, deep, glossy colors with process-printed magnets. Detailed, matt-finish colors with digitally printed magnets. Get creative! The best part about a magnet is that you can put it on, take it off, and move it around. If outdoors, do remove and clean under your magnet once in a while (weekly is best, but less often is OK too unless you live in a desert where everything gets baked on). Also remember that direct sun will eventually cause color fading on your magnet if you car stays outdoors all day long. "Support our Troops" Rubber Bracelet Wristband - Yellow - Adult 8"